The Maine Red Claws, presented by Quirk Chevrolet, today announced that rookie forward DeShawn Sims has been named the 2011 NBA Development League Rookie of the Year. It was the latest honor for the 23-year-old Sims, who was also selected to the 2011 NBA Development League All-Star Team and was named to the NBA Development League All-Rookie First Team and the All-NBA Development League Third Team. Sims, who joined the Red Claws in the second weekend of the season, finished fourth overall in league scoring and first among rookies with 20.3 points per game in 48 games this season. His 7.7 rpg ranked 11th overall in the league while he was 9th with 5.6 defensive rebounds per game. Sims represented the Red Claws at the 2011 NBA Development League All-Star Game where he scored 20 points in 20 minutes of play. He posted double-doubles in 13 games this season and contributed double digits in all but six. 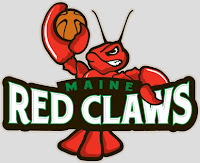 He scored a Red Claws season-high 35 points on March 3, one of seven 30+ point performance of his rookie season. JAMAR SMITH NAMED TO ALL-ROOKIE SECOND TEAM: Red Claws rookie guard Jamar Smith also received recognition from the NBA Development League today, landing on the 2011 All-Rookie Second Team. Smith had an outstanding rookie season despite being hampered much of the season with a painful foot injury. Considered among the best shooters in the league, Smith average 13.5 points per game and finished 4th overall in 3-pointers made (2.2 per game) and 6th in 3-point percentage (.432).